Tinnitus remains a huge burden worldwide. It is said to affect one third of persons at some point in their lives. Various therapeutic approaches have been tried without a seemingly appreciable result. This article reviews the role of repetitive transcranial magnetic stimulation (rTMS) as a novel method of treating patients with tinnitus. To review the literature on rTMS in the management of tinnitus. Literature search using a systematic review of available databases such as PubMed, EMBASE, Cochrane library, Web of science and Science Direct was used. The efficacy of this new method of treating tinnitus is yet to be fully documented. Long-term effects such as induction of metaplastic change, genetic mutation from the magnetic fields surrounding the underlying tissues are all possible. To improve and strengthen acceptability in its efficacy, some of these adverse effects have to be adequately controlled. Objective: To evaluate the efficacy of butterfly cartilage tympanoplasty for small- and medium-sized central perforations and compare it with temporalis fascia tympanoplasty. Materials and Methods: A prospective, comparative study was conducted on 110 patients, divided into two groups. Patients of tubotympanic type of chronic suppurative otitis media with 2–6 mm size perforation were included in the study. Fifty-five patients were operated by temporalis fascia Type I tympanoplasty and rest 55 by butterfly cartilage tympanoplasty (transcanal technique) under local anesthesia. Results were compared in terms of pre- and post-operative air-bone gap improvement and success rates. Results: In our study, in terms of outcomes, both techniques had similar results. The success rate was 93.7% in butterfly cartilage tympanoplasty and 96.3% in temporalis fascia group. However, in terms of time taken, butterfly cartilage tympanoplasty took less time (about 30 min) than temporalis fascia (about 55 min). Conclusion: Transcanal butterfly cartilage tympanoplasty is a very good alternative in small- and medium-sized perforations for conventional temporalis fascia tympanoplasty as it is simple, takes less time, day care procedure, on table hearing improvement, cosmetically no postoperative scar, no need of post aural preparation, and patient can go home within hours. Background: Musicians outperform nonmusicians on brainstem and cortical level processing. However, there are limited literature comparing musicians and nonmusicians on the overall release of masking abilities and correlation across otoacoustic emissions (OAEs), masking level difference (MLD) and quick speech-in-noise (Quick-SIN). Aim: To investigate the physiological differences between musicians and nonmusicians by evaluating the effect of musical training on contralateral suppression (CAS) of OAE, MLD, and Quick-SIN. Materials and Methods: Distortion product OAEs (DPOAEs) recording with and without noise, MLD test using continuous (CMLD) and pulsating pure tones (PMLD) and Quick-SIN in Kannada were carried out on 15 musicians and 15 nonmusicians. Results: Musicians outperformed nonmusicians on Quick-SIN and CAS of OAEs. However, no significant difference was observed between two groups on CMLD and PMLD. There was a significant difference observed in CMLD, PMLD as well as suppression amplitude across frequencies tested in both groups. A significant difference between PMLD and CMLD was observed only for musicians at 2 kHz. In both groups, there was a significant level of correlation for CAS of DPOAE and Quick-SIN with CMLD and with PMLD between the parameters tested. Conclusion: The results of our finding suggest that CAS of DPOAE and Quick-SIN are sensitive tools to quantify the effect of musical training, compared to MLD. Musical training helps to strengthen afferent and efferent pathways, and hence it aids in speech perception abilities in noise. Hence, for the intervention of individuals with difficulties in speech perception in noise, musical training can be a choice to be considered. As well for appropriate diagnosis and interpretation, one needs to consider the musical experience of individual tested. Context: In the competing background, noise speech cues are compromised. In quiet and noisy conditions, the distribution and weighting of temporal cues for the speech perception vary across different frequency spectrum. Temporal fine structure (TFS) cues help in perceiving speech in noise. Knowledge about the perceptual weighing of fine structure cues is essential for the design of assistive listening devices Aims: In the present study, the perceptual weighing of the fine structure cues across frequency bands in different listening conditions is measured. Settings and Design: Data were collected in a double room set up and adapted Plomp (1986) sentence speech recognition threshold (sSRT) method was used. Subjects and Methods: Forty normal hearing individuals presented without and with (very low frequency [VLF], low frequency, mid frequency [MF], and high frequency) filtered fine structure bands of hearing in noise test sentences. 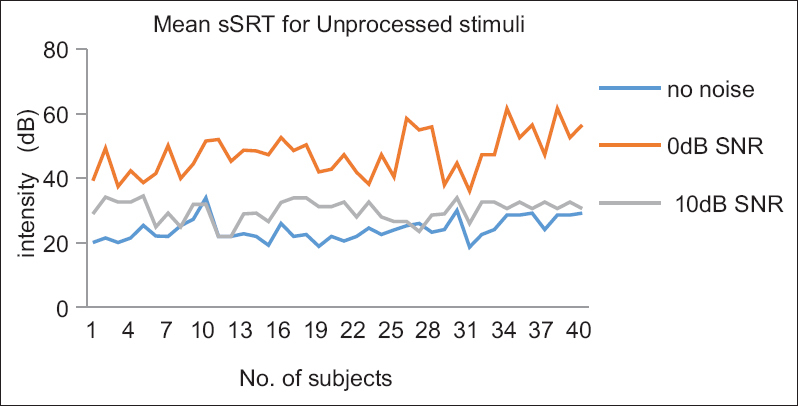 sSRTs were measured for uninterrupted and interrupted stimulus in different signal to noise conditions (quiet, 0 dB, +10 dB, and −10 dB). ANOVA, post hoc, and bivariate Karl Pearson correlation statistical analysis were used. Results: The sentence recognition for filtered stimulus in quiet and in noise resulted in significantly higher relative perceptual weight placed upon the TFS in the VLF band and MF at 0 dB signal to noise ratio (SNR) (P < 0.001). The relative weighting of fine structure cues demonstrated the importance VLF band in quiet and noisy conditions and of the MF band that contains dynamic formant movement at 0 dB SNR condition. Objectives: The purpose of this study was to determine the various etiologies of traumatic tympanic membrane (TM) perforations; their clinical presentation, observation and establish masterly inactivity as the main modality of management. 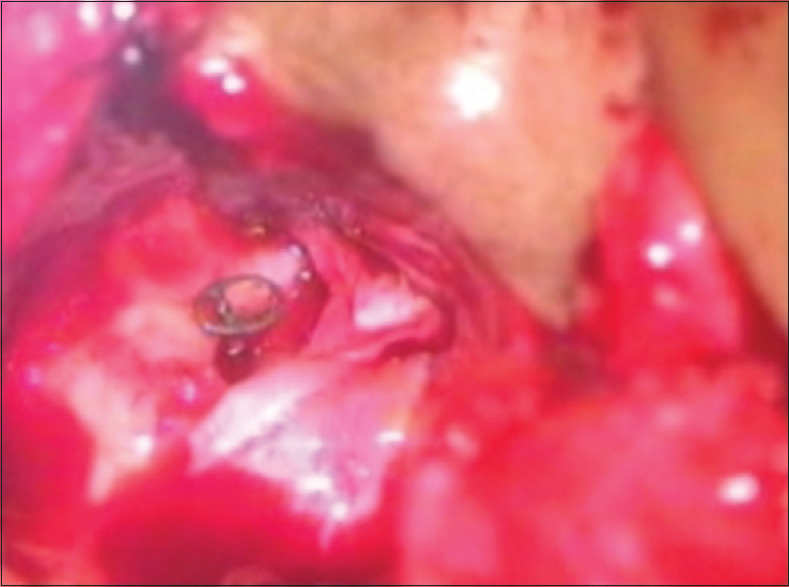 Materials and Methods: A prospective study was performed on 350 cases of traumatic TM perforation in the Department of ENT, SKIMS Medical College, Srinagar from January 2010 to December 2014. Results: A total of 350 patients with the traumatic TM. Perforation was enrolled for this study. The group consisted of 231 male and 119 female patients. It affects all age groups with the highest incidence among middle age group. The right ear was involved in 94 (26.85%) patients, the left ear in 249 (71.14%) patients and bilateral ear involvement was seen in 7 (2%) patients. The type of trauma included compression injury in 243 (64.42%) patients, instrumental injury in 88 (25.14%) patients, and blast injury in 19 (5.42%) patients. Tinnitus was the most common complaint, followed by aural fullness, impaired hearing, otalgia, bleeding from ear and vertigo. 217 (62%) patients presented with conductive hearing loss in the range of 20–35 dB, 77 (22%) patients with <20 dB, 28 (8%) patients presented with >35 dB hearing loss, and 28 (8%) patients presented with no air-bone gap. Grade I perforation (<25% TM involvement) was seen in 91 (26%) patients, Grade II perforation (25–50% TM involvement) was seen in 221 (63.14%) patient, and Grade III perforation (>50% TM involvement) was present in 38 (10.90%) patients. Complete healing was observed within 2–6 weeks in 172 (49.10%) patients and within 7–9 weeks in 112 (32.20%) patients. 35 (10%) patients showed complete healing within 10–12 weeks. The minimum time taken to heal was 21 days and maximum time 72 days. Complete healing was observed in 319 (91.10%) patients. The intervention was only performed when spontaneous healing failed to occur after observing the patients for 1 week and included tympanoplasty in 8 (2.30%) patients, trichloroacetic acid cauterization in 14 (4%) patients. Residual perforation was observed in 9 (2.5%) patients. Conclusion: In our experience, traumatic TM perforation is still very common. Slap, instrumentation, road traffic accident, and blast injuries are common etiologies seen. It affects all age groups. Tinnitus and hearing loss are commonest symptoms. The masterly inactivity should be religiously followed and unnecessary surgical intervention should be discouraged. Background: Hearing impaired cases attending ear, nose, and throat (ENT) OPD were assessed for hearing loss and associated factors of Garhwal region of Uttarakhand. There has not been any such study yet in this region. Objective: Epidemiological study to investigate the hearing loss and its associated diseases in general population Garhwal region of Uttarakhand reporting in ENT OPD. Materials and Methods: This was a prospective study carried out on OPD basis and a total of 300 patients were included in the study. The study included all the patients attending ENT OPD with a complaint of hearing loss. The exclusion criteria were as follows: Patients who were unable to respond to pure tone audiometry (PTA) test. 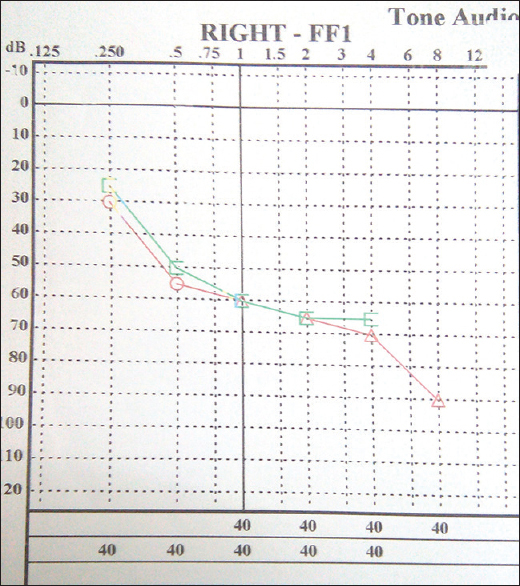 Assessment of hearing loss was done by PTA, which was done by a certified audiologist of the department. 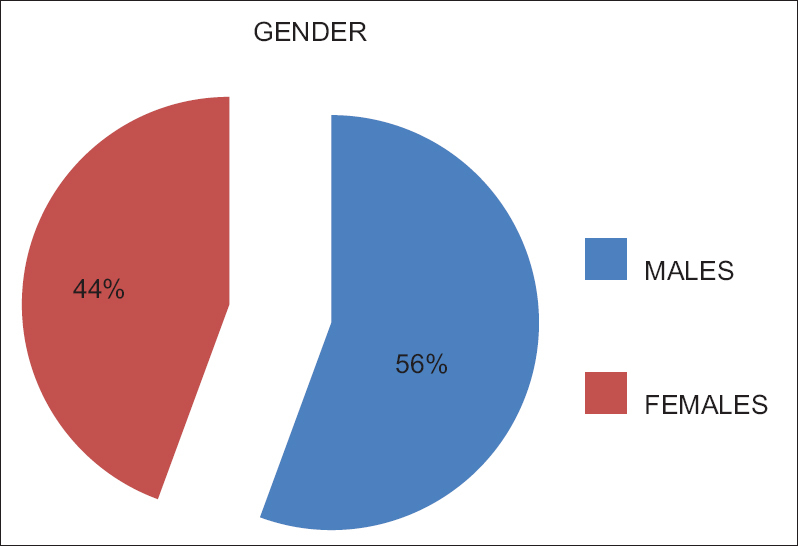 Results: Predominantly, patients were male of the late 50s. Moderate-severe sensory neural hearing loss was the most common type of hearing loss and intact tympanic membrane being most common otoscopic finding. The most common cause of hearing loss in this study group was presbycusis. Conclusion: Presbycusis is most common presentation of hearing loss in Garhwal region of Uttarakhand. Background and Objectives: Intratympanic gentamicin therapy is an effective modality for control of vertigo in Meniere's disease (MD) and when given in low concentration (<30 mg/mL), once weekly minimizes its side effects like chronic vestibular insufficiency or hearing loss. We studied the efficacy of low dose interval intratympanic gentamicin therapy in control of intractable vertigo in MD and the postprocedure hearing loss. As gentamicin is vestibular end-organ selective and not specific for treatment of MD alone we studied its efficacy in non-Meniere's peripheral vertigo (NMPV) in patients with nonserviceable hearing in affected ear. Subjects and Methods: Our study included 13 patients with “Definite” MD and seven patients with NMPV. In MD group, one treatment series consisted of a maximum of 3 weekly intratympanic gentamicin injections of 0.3 mL (12 mg) of gentamicin. In NMPV group, the schedule was similar but dosage per injection was 0.5 mL (20 mg). Another similar series of injections were repeated for recurrences. Results: Significant reduction was noted in number of vertigo spells in both groups after treatment (P < 0.001). All the patients experienced either complete or substantial control (Class A or B) of their vertigo. The functional level scale had significantly improved posttreatment in both groups (P < 0.01). No significant worsening in hearing was noted in any of the patients in MD group. Interpretation and Conclusion: Low dose interval intratympanic gentamicin is a simple cost-effective office procedure for managing vertigo in patients with MD and in patients with NMPV and nonserviceable hearing. 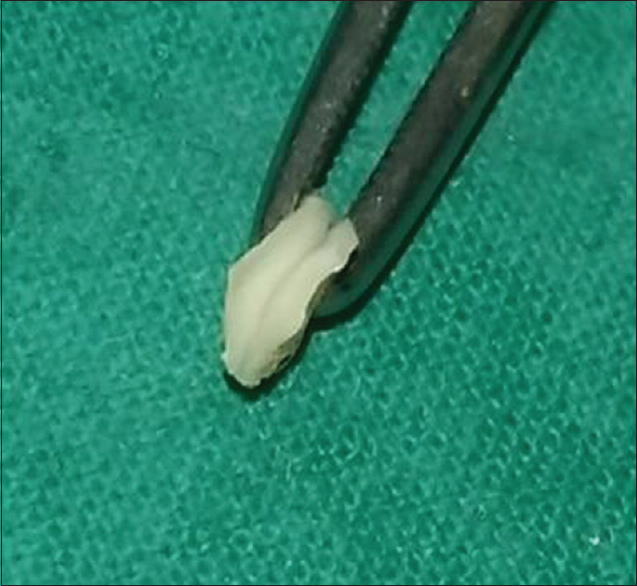 Background: Numerous graft materials are available for ossicular reconstruction yet, no single option is considered ideal. This study aims to analyze and compare the outcome of primary ossiculoplasty in terms of hearing gain using autograft incus and titanium (Ti) prostheses in patients with active squamosal chronic otitis media (COM) undergoing modified radical mastoidectomy (MRM). Study Design: Randomized study. Materials and Methods: Sixty patients with active squamosal COM with ossicular chain erosion undergoing MRM were divided into two equal groups. First group underwent ossiculoplasty with autograft incus and the second group received Ti prostheses. Follow-up was done over a period of 6 months and hearing thresholds were evaluated postoperatively at 3rd and 6th month at the four frequency average of 0.5/1/2/4 KHz. Results: There was no significant difference in air conduction (AC) gain when the inter-group comparison is made (P > 0.05 at 3rd and 6th month), however, intra-group AC gain was significant in both groups, at the end of the 3rd month and 6th month (P < 0.05). Conclusion: Autograft incus and Ti prostheses both give a comparable hearing gain in ossicular reconstruction. Ti prostheses are a good alternative in longstanding cases of active squamous COM without any available ossicular autograft for hearing reconstruction. Multiple sclerosis (MS) is the most common demyelinating disease of the central nervous system. MS is a neuromotor disorder which progresses with remissions and relapsing periods. Symptoms of MS plaques may regress completely or heal by leaving sequelae. Symptomatology of MS may be very variable. These symptoms usually show variations depending on the localization of demyelinated plaques in the central nervous system. In this case, we are presenting a case of sudden sensorineural hearing loss in alternate ears with magnetic resonance images suggestive of demyelinating disorders. These hearing losses are improved completely as disease has remission and relapsing periods. Submandibular sialolithiasis is the most common disease of salivary glands. Giant stone of more than 3 cm is extremely rare with only 17 cases reported in literature. In this short communication, we report a young gentleman, presented with an enlarged tender left submandibular gland and hard mass within Wharton duct. Neck ultrasound revealed left submandibular duct stone with an associated abscess confirmed by computed tomography scan. Medical management followed by left submandibular intraoral stone extraction with marsuplization of the duct 2 weeks later was done. The sialoliths was about 3.6 cm. 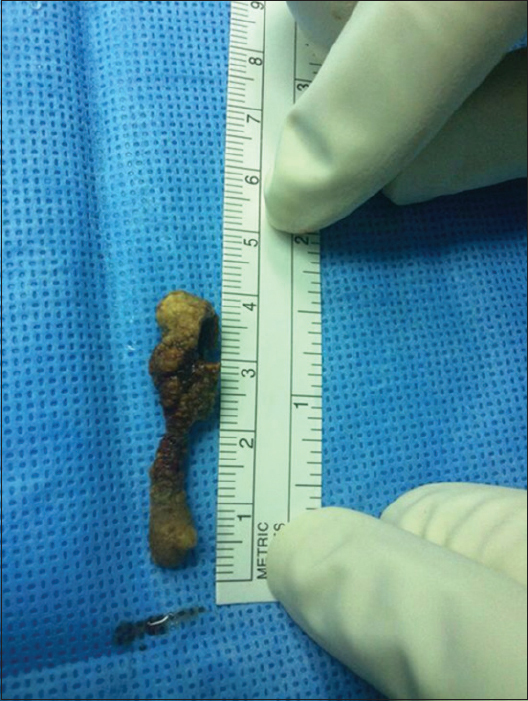 The patient had smooth recovery with no complications in follow-up. The aim is to report an unusual site of aural foreign body (FB) and rare cause of granulomatous myringitis. We present the case of a 37-year-old male who presented with progressive radiation therapy otalgia, otorrhea, and aural fullness after unskillful aural FB removal, and diagnostic microscopic examination of the ear shows missed impacted transcendental meditation FB leading to granulomatous myringitis. Myiasis is a disease caused by fly larvae and aural myiasis is a rare clinic condition often occurring in children or mentally retarded people. We report the case of an unusual presentation of a unilateral aural myiasis in a 3-year-old female child patient belonging to a slum with unilateral chronic otitis media caused by Musca domestica (housefly) larvae. 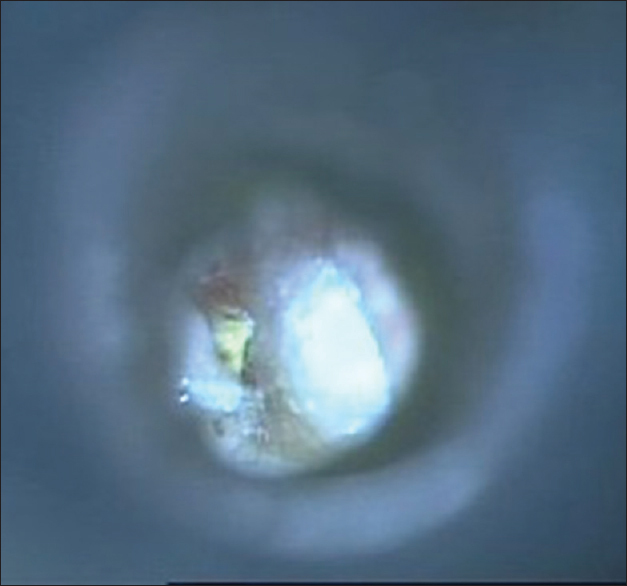 Eight larvae were removed from the external auditory canal while five more larvae were located in the middle ear cavity and were removed through perforation of the tympanic membrane. Management of ear myiasis is based on removal of the maggots and cleansing of the ear with ethanol, chloroform, or physiological saline. Physiological saline is preferred in patients who have tympanic membrane perforation. Myiasis is related to personal hygiene. Therefore, to decrease the incidence of these infestations, care, and hygiene standards should be carried out for those at risk through information, education, and communication. It is well known fact that persons with lesions involving either the right or left temporal lobe tended to show impaired performances for complex auditory task and showed auditory processing disorder symptoms. Present study was aimed to find out whether auditory processing deficit exists in individuals with Broca's aphasia due to stroke based on case studies outcomes through detailed behavioral and electrophysiological audiological assessment. There were two participants (case 'A' and case 'B') diagnosed as having Boca's aphasia taken for the study. Case 'A' and 'B' were 39 and 29 year old male participated in the study. They were assessed for routine audiological and detailed auditory processing disorders tests like pitch pattern test, gap detection test and dichotic digit test. Further, they were also assessed for electrophysiological tests like click evoked auditory brainstem response and auditory late latency response. The routine audiological tests reveal no peripheral hearing loss in both the cases. However, details behavioral (C)APD tests results revealed overall poorer performance for different tasks in both cases. In addition to that, electrophysiological tests results also revealed abnormal brainstem and cortical responses in both cases. Hence, preliminary report of the present study suggests that cases with lesion (strokes) should be evaluated in detail for auditory processing deficit. 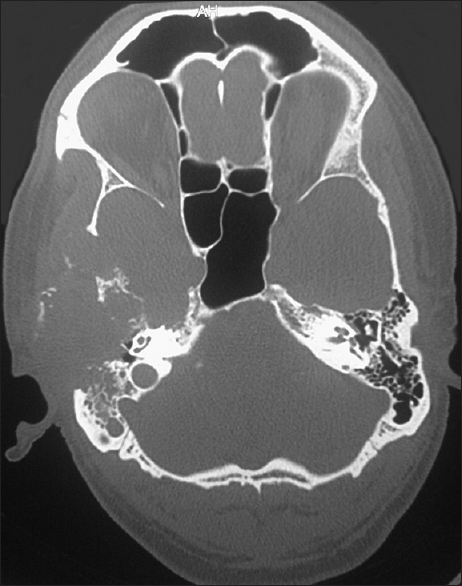 Eosinophilic granuloma is an uncommon granulomatous disease which can affect the temporal bone. Also known as Langerhans cell histiocytosis, the lesion is characterized by uncontrolled proliferation of Langerhans cells. Although initially silent, the disease may erode the mastoid cortex, destroy the tegmen, and extend into the cranial vault, as well as erode the semicircular canals or cochlea. These lesions almost always become infected and can be confused with chronic otomastoiditis. Equally important, temporal bone involvement may represent only one manifestation of a multifocal disease. This report describes a case of 40-year-old male with eosinophilic granuloma involving the right temporal bone extending into midbrain region causing focal compression and displacement of part of the temporal lobe.